To watch Oscar Pistorius race was breath-taking. As one commentator wrote, "For us South Africans, it is impossible to watch Oscar Pistorius run without wanting to break down and cry and shout with joy." There he would sprint - like a figure from the future on his carbon fiber blades - the very sobriquet used to describe him, "the fastest man on no legs," bestowed on him an almost mythical superhero status. And when the fall from grace came, it was all the more devastating in just how far down he fell. I have sat in the courtroom from the very first day and observed Pistorius's unraveling. It has been to say the least, disturbing. This is not the story South Africans like to tell of themselves. This is after all the nation of Nelson Mandela, the plucky little country that defied the odds and voted in an all-race election after decades of brutal racism. The country was transformed into a democracy not through a bloody coup but through the ballot box and Mandela went on to become a global icon. And so it seemed that Pistorius fitted neatly into this remarkable story - the man who turned disadvantage into advantage, disability into ability. But I couldn't help thinking as I sat in that courtroom that perhaps part of the problem with the Oscar Pistorius fairy tale was that those around him, including the media, never thought to put limits on his growing ego. So desperate was South Africa to believe in its heroes that nobody questioned Pistorius's moments of weakness. There was a boating accident at a dam on the outskirts of Johannesburg in which Pistorius was badly injured and alcohol was later found on the boat - it was shrugged off with the comment "boys will be boys." Astoundingly, Pistorius fired a loaded weapon in a crowded public restaurant with a child sitting nearby and not one of the managers, the staff nor members of the public thought to report it to the police. And then there was that ugly moment at the London Paralympics when Pistorius threw a temper tantrum in full view of the cameras after he lost the 200 meter sprint to Alan Oliveira. Pistorius was furious blaming it on the fact that Oliveira's racing blades were longer than the legal limit and had given him an unfair advantage. But the media hardly blinked in the face of these stories - Pistorius was a hero and South Africa, indeed the world - adored him. 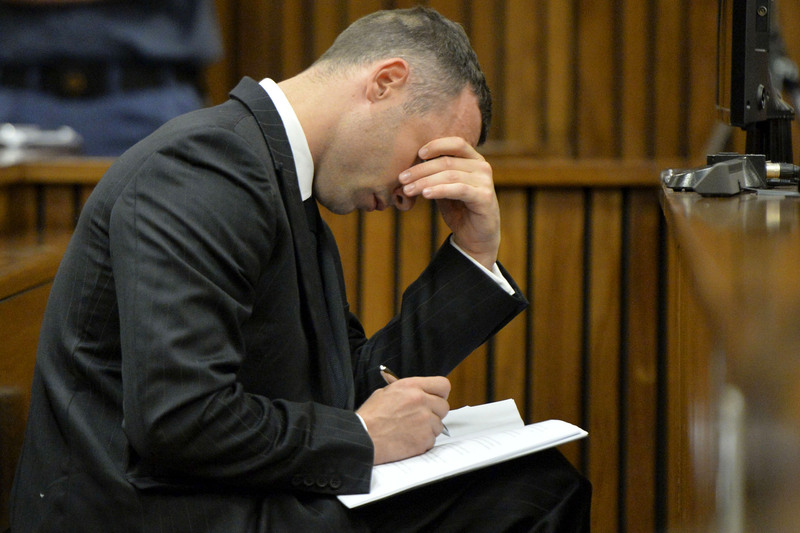 To sit in court then and watch him sob and vomit his way through his testimony has shown a side of Pistorius nobody could have imagined. Whether the reaction was pity or revulsion - this was never the story Pistorius liked to tell of himself. At one point he endured what must have been a tortuous humiliation as he removed his prosthetic legs and stood on his gnarled, weak-looking stumps to demonstrate his height. He had never looked more vulnerable than at that moment. Watching this all, of course, was Reeva Steenkamp's mother June. I sit two rows behind her and we greet each other regularly. But beyond that, she says nothing, keeping a stoic, often impassive face throughout. But the hell of having to repeatedly listen to how her daughter died in a hail of bullets must be unbearable. The emotion in the courtroom has been raw, just as this story has touched a nerve in South Africa. This is a country that has an appetite for violence - as one columnist wrote "we like our meat bloody and raw." But in a country that has become desensitized to violent crime, this killing still has the power to move the entire country. Sitting in court, I contemplated the fact that whatever argument you buy - tragic accident or pre-meditated murder - both speak to an unsettling South African reality. Was it fear or rage? For some white South Africans, there is still the unspoken fear of the threat of the black intruder who could break into your home at any point. And the explanation of rage speaks to another pressure point - this is a country at war with its women, evidenced by the horrific and growing statistics of domestic violence in South Africa. Pistorius achieved incredible athletic feats - of that there is no doubt. But he was also a man who from a young age had become used to adulation and fame. And whatever the truth of this case, we have been exposed to his dark side in that Pretoria courtroom: his disturbing obsession with and reckless use of guns, his narcissistic control of his girlfriend and his extreme paranoia. He was held up as a role model for South Africa without any real investigation as to whether he had the right character to assume that role. In a country still plagued by senseless criminal violence, South Africa needs a different kind of role model. It can't always be about who runs the fastest or who kicks the hardest. Watching a broken Pistorius in court provided the realization that in our desire to elevate sporting stars to almost godlike status, we make the mistake of forgetting to interrogate the character beneath their talent. Perhaps if that had been done sooner, the killing of Reeva Steenkamp - whether accident or murder - could have been prevented. Debora Patta is a CBS correspondent. She investigates the case against South Africa's legendary "Blade Runner" Oscar Pistorius on a special "48 Hours," Monday at 10 p.m. ET/PT on CBS.